University students attend an anti-government protest inside Tehran University, Iran. IRAN's Supreme Leader, Grand Ayatollah Ali Khamenei, has accused foreign powers of clandestine sabotage, and other senior officials have alleged the US, Britain and Saudi Arabia are responsible for instigating the protests that have led to bloodshed and destruction. However, the Opposition and various officials say what happens in the streets of Iran in the next few days will shape the response of the government in Tehran, which is under mounting pressure from hardliners and conservative clerics to crack down on protests. So far in the six days of protests, 22 people have been killed. Police stations and militia bases have been attacked and at least 450 protesters arrested. 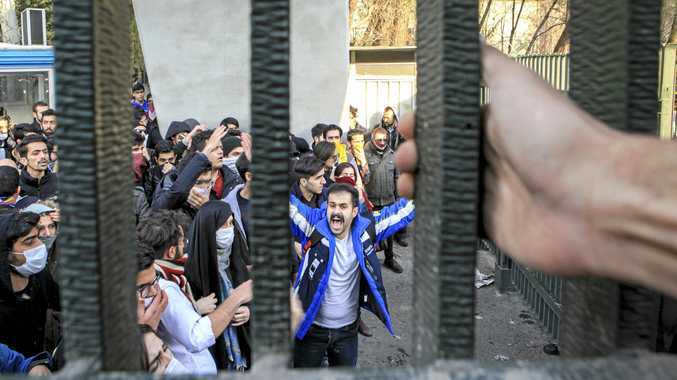 The reformist government of Hassan Rouhani has claimed it is avoiding violent showdowns - with the police out on streets and the Revolutionary Guards keeping to barracks. But Ayatollah Khamenei's intervention, saying the nation is under attack, may pave the way for more punitive action. "The enemies of Iran are deploying every means at their disposal including money, arms and political and intelligence support to co-ordinate making trouble for the Islamic establish- ment,” the Supreme Leader said. US President Donald Trump has kept up a stream of tweets effectively calling for an uprising in Iran. "The people of Iran are finally acting against the brutal and corrupt Iranian regime,” he tweeted yesterday. Ayatollah Khamenei did not name any of the supposed enemy states, but Ali Shamkhani, the secretary of the Supreme National Security Council, blamed the US, Britain, and Saudi Arabia for the violence. "The Saudis will receive Iran's response and they know how serious it will be,” he warned. The protests have been described as the largest since those of the Green Movement who took to the streets in 2009 in response to the allegedly fraudulent election of Mahmoud Ahmadinejad.